It has been some time since we picked a website, truth be told, its not that there aren’t great sites out there but its been difficult to keep on top of what was a weekly feature. That said, we will still share great sites as we dive into them and one such site is Improve Photography. This site is the home of photographer and author Jim Harmer and a great resource. 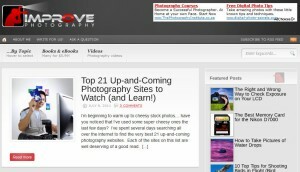 We have to thank him for adding us to his list of Top 21 Up-And-Coming Photography Sites to Watch. Improve Photography is now on my Google Reader.